This question relates to iOS pre-3.2. As of 3.2, this functionality is easily achievable using samvermette's answer below, and I have changed the Accepted Answer (from command to samvermette) to reflect this. I can't give credit to both answers (besides upvotes) but they are both good. I would like to have an app include a custom font for rendering text, load it, and then use it with standard UIKit elements like UILabel. Is this possible? but these would require me to render each glyph myself, which is a bit too much like hard work, especially for multi-line text. I've also found posts that say straight out that it's not possible, but without justification, so I'm looking for a definitive answer. which resulted in an exception being thrown. 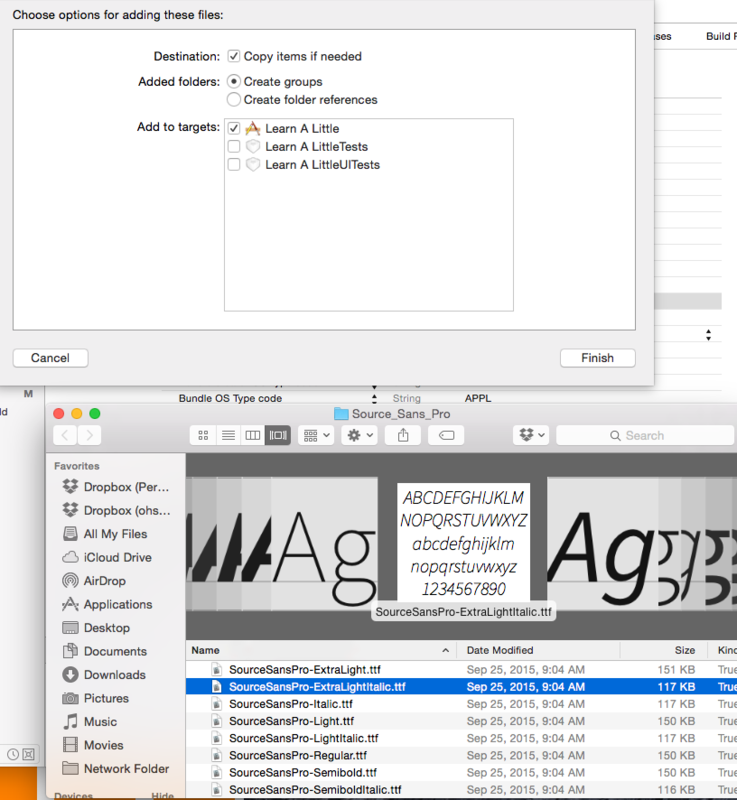 Looking at the TTF file in Finder confirmed that the font name was Harrowprint. EDIT - there have been a number of replies so far which tell me to read the documentation on X or Y. I've experimented extensively with all of these and got nowhere. In one case, X turned out to be relevant only on OS X, not on iPhone. Consequently, I am setting a bounty for this question, and I will award the bounty to the first person who provides an answer (using only documented APIs) who responds with sufficient information to get this working on the device. Working on the simulator too would be a bonus. EDIT - It appears that the bounty auto-awards to the answer with the highest number of votes. Interesting. No one actually provided an answer that solved the question as asked - the solution that involves coding your own UILabel subclass doesn't support word-wrap, which is an essential feature for me - though I guess I could extend it to do so. Applications that want to use custom fonts can now include those fonts in their application bundle and register those fonts with the system by including the UIAppFonts key in their Info.plist file. The value of this key is an array of strings identifying the font files in the application’s bundle. When the system sees the key, it loads the specified fonts and makes them available to the application. Once the fonts have been set in the Info.plist, you can use your custom fonts as any other font in IB or programatically. Add a key to your Info.plist file called UIAppFonts. Also: Make sure the fonts are in your Copy Bundle Resources. Edit: As of iOS 3.2, this functionality is built in. If you need to support pre-3.2, you can still use this solution. I created a simple module that extends UILabel and handles loading .ttf files. I released it opensource under the Apache license and put it on github Here. The important files are FontLabel.h and FontLabel.m. It uses some of the code from Genericrich's answer. There is a simple way to use custom fonts in iOS 4. 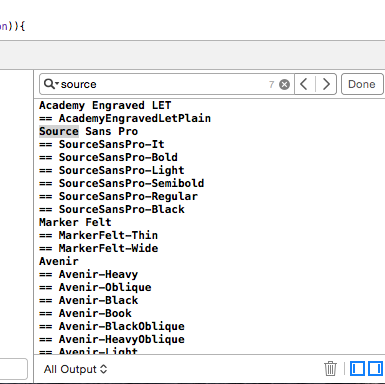 Add your font file (for example, Chalkduster.ttf) to Resources folder of the project in XCode. Open info.plist and add a new key called UIAppFonts. The type of this key should be array. Add your custom font name to this array including extension (Chalkduster.ttf). Now you can use [UIFont fontWithName:@"Chalkduster" size:16] in your application. The only way I've been able to successfully load custom UIFonts is via the private GraphicsServices framework. 1) Drag and drop your font to Xcode Supporting Files folder. Don't forget to mark your app at Add to targets section. From this moment you can use this font in IB and choose it from font pallet. 2) To make this font available to in your device, open your info.plist and add Fonts provided by application key. It will contain Item 0 key, you must add your font name as the value. Font name can vary from your font file name. But first, try to add your filename in most cases this work. If not, this article always helped me. Here is swift snippet of the code from this article to help you find your font name. I want to mention, that you need to add font files to your Target's Build Phases, Copy Bundle Resources. Without it, you won't see your font on the device. And it could lead to unexpected behaviour. For example, I encounter a bug, when UITextField have custom font, but this font wasn't in the Copy Bundle Resources. And when I segue to the viewcontroller with this textfield, there is a delay about 4 seconds before viewDidLoad function was called. Resolving font troubles removed this delay. So, recommend to check it twice. (rdar://20028250) Btw, I wasn't able to reproduce the bug, but I'm sure that problem was with the font. // Get the path to our custom font and create a data provider. // Create the font with the data provider, then release the data provider. // Set the customFont to be the font used to draw. // Set how the context draws the font, what color, how big. // Create an array of Glyph's the size of text that will be drawn. // Loop through the entire length of the text. // Store each letter in a Glyph and subtract the MagicNumber to get appropriate value. Basically you have to do some brute force looping through the text and futzing about with the magic number to find your offset (here, see me using 29) in the font, but it works. Also, you have to make sure the font is legally embeddable. Most aren't and there are lawyers who specialize in this sort of thing, so be warned. Yes, you can include custom fonts. Refer to the documentation on UIFont, specifically, the fontWithName:size: method. 1) Make sure you include the font in your resources folder. 2) The "name" of the font is not necessarily the filename. 3) Make sure you have the legal right to use that font. By including it in your app, you're also distributing it, and you need to have the right to do that. Add the font to your project. I dragged and dropped the OTF (or TTF) files to a new group I created and accepted xcode's choice of copying the files over to the project folder. Create the UIAppFonts array with your fonts listed as items within the array. Just the names, not the extension (e.g. "GothamBold", "GothamBold-Italic"). Click on the project name way at the top of the Project Navigator on the left side of the screen. Click on the Build Phases tab that appears in the main area of xcode. Expand the "Copy Bundle Resources" section and click on "+" to add the font. Select the font file from the file navigator that pops open when you click on the "+". Do this for every font you have to add to the project. Here's the step by step instructions how to do it. No need extra library or any special coding. Most of the time the issue is with the font not the method. The best way to do it is to use a font that for sure will work, like verdana or geogia. Then change to the intended font. If it does not work, maybe the font name is not right, or the font is not a well formated font. It is very easy to add a new font on your existing iOS App. You just need to add the font e.g. font.ttf into your Resource Folder. Open your application info.plist. Add a new row as "Fonts provided by application" and type the font name as font.ttf. And when setting the font do as setFont:"corresponding Font Name"
You can check whether your font is added or not by NSArray *check = [UIFont familyNames];. It returns all the font your application support. I would recommend following one of my favorite short tutorials here: http://codewithchris.com/common-mistakes-with-adding-custom-fonts-to-your-ios-app/ from which this information comes. Find the TTF in finder and "Get Info". Under the heading "Full name:" it gave me a name which I then used with fontWithName (I just copied and pasted the exact name, in this case no '.ttf' extension was necessary). It's not out yet, but the next version of cocos2d (2d game framework) will support variable length bitmap fonts as character maps. The author doesn't have a nailed down release date for this version, but I did see a posting that indicated it would be in the next month or two. One important notice: You should use the "PostScript name" associated with the font, not its Full name or Family name. This name can often be different from the normal name of the font. Maybe the author forgot to give the font a Mac FOND name? There is a "Mac" Option where you can set the FOND name. You could also give the "Apple" option in the export dialog a try. DISCLAIMER: I'm not a IPhone developer! Simply using [UIFont fontWithName:size:] with the fonts in the Resources directory will not work, even if the FOND name is set using FontForge. [UIFont fontWithName:size:] will work if the fonts are loaded first using GSFontAddFromFile. But GSFontAddFromFile is not part of iOS 3.1.2 so it has to be dynamically loaded as described by @rpetrich. A simple plist entry that allows you to include the font file(s) in your app resources folder and they "just work" in your app. I've combined some of the advice on this page into something that works for me on iOS 5. First, you have to add the custom font to your project. Then, you need to follow the advice of @iPhoneDev and add the font to your info.plist file. However, you need to know the Postscript name of your font. Just follow @Daniel Wood's advice and press command-i while you're in FontBook. Then, enjoy your custom font. Add your custom font name to this array including extension ("Chalkduster.ttf"). Use [UIFont fontWithName:@"Real Font Name" size:16] in your application. BUT The "Real Font Name" is not always the one you see in Fontbook. The best way is to ask your device which fonts it sees and what the exact names are. 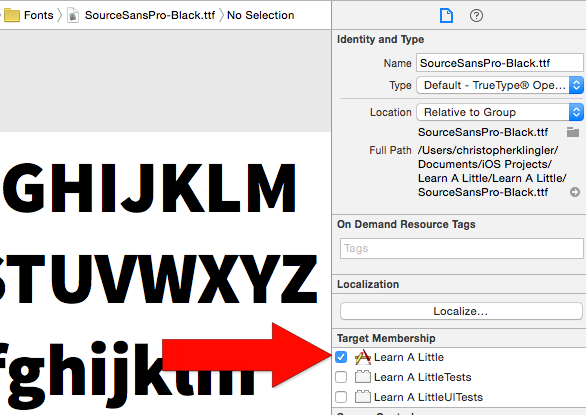 Just drop the fonts you want into the xcode project, add the file name to its plist, and run it on the device you are building for, it will email you a complete font list using the names that UIFont fontWithName: expects. Better solution is to add a new property "Fonts provided by application" to your info.plist file. Then, you can use your custom font like normal UIFont. There is a new way to use custom fonts, starting with iOS 4.1. It allows you to load fonts dynamically, be they from files included with the app, downloaded data, or what have you. It also lets you load fonts as you need them, whereas the old method loads them all at app startup time, which can take too long if you have many fonts. let fontData = NSData(contentsOfFile: filePath)! You can add the required "FONT" files within the resources folder. Then go to the Project Info.plist file and use the KEY "Fonts provided by the application" and value as "FONT NAME". When you drag the fot files(otf or ttf) DONT forget to check the checkbox under "Add to targets". After doing that your font will appear and everything will work fine. Although some of the answers above are correct, I have written a detailed visual tutorial for people still having problems with fonts. Not the answer you're looking for? Browse other questions tagged ios cocoa-touch fonts or ask your own question. how set custom font for whole all labels in a view? How do I add a custom font to my app? Can I embed a custom font in an Android application?